This desert-chic bedroom by House Updated proves that mixing aesthetics can make for a stunning decor scheme. The pared-back furniture and bright white walls provide a simple backdrop for a variety of global patterns, which appear to match thanks to their shared small prints. A burst of geometric lines in the art above the bed balance out the blanket and pillow, while the plants throw in a bit more interest without overwhelming the space. It all sounds like a lot, but the accessory that keeps everything in check is the kilim rug. It quietly drives this look home from below, adding aesthetic warmth to the stark color contrasts above. 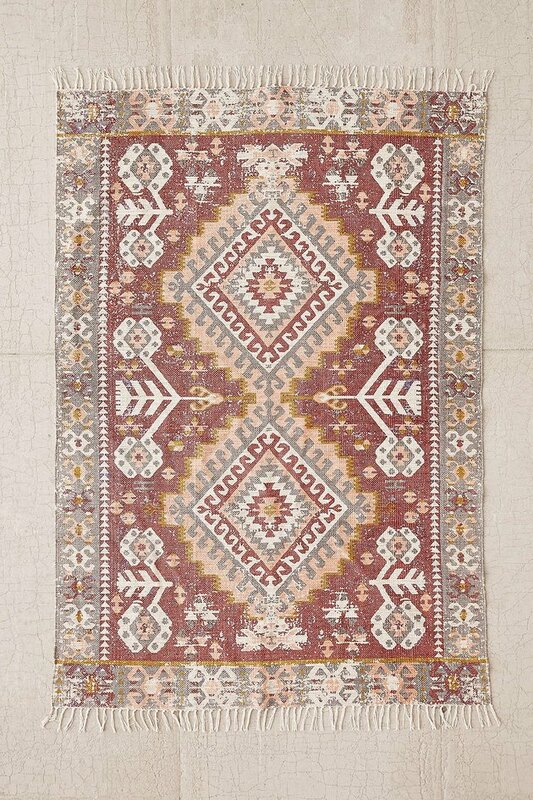 Take a page from this design's book and warm up your look with a kilim rug of your own.